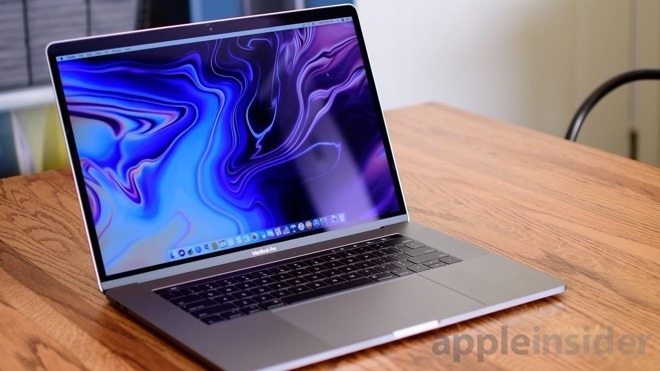 Apple has started to offer the 15-inch MacBook Pro to customers with updated graphics options, with configurations of the notebook using AMD's Radeon Pro Vega GPUs now available to purchase from Apple directly. Quietly revealed during Apple's special event in October alongside other Mac and iPad changes, the upgraded options to add more powerful graphics to the MacBook Pro went live on Wednesday. Under the change, customers can elect to have a Vega 16 or Vega 20 graphics processing unit (GPU) as a discrete graphics alternative to the integrated Intel UHD Graphics 630. Previously, buyers of the 15-inch MacBook Pro had the option of a Radeon Pro 555X or Radeon Pro 560X GPU, each with 4GB of GDDR5 memory, to be installed in the notebook. Under the new options, users can elect for a Vega 16 or Vega 20, both with 4GB of HBM2 memory. The Vega 16 and Vega 20 are equipped with what AMD describes as "Vega next-generation compute units," with each having 16 and 20 compute units respectively. The GPU also includes a feature called Rapid Packed Math, that accelerates processing of workloads in realtime and can cut down the resources required for repetitive tasks. It is claimed opting for the Vega 16 and Vega 20 will offer a 60-percent performance improvement over the Radeon Pro 560X, making it useful for mobile creative professionals working in video editing, 3D design, and graphics-heavy workflows. The second-generation High Bandwidth Memory offers a number of bonuses over GDDR5 memory, with more memory bandwidth per chip and lower power consumption offered by HBM2. By being located on the GPU package, it can also offer physical space savings within the MacBook Pro, which could allow Apple to further refine the logic board to be smaller. The new options are available from Apple's online store and through its retail outlets as custom orders only, as well as via Apple Authorized Resellers. To upgrade from the Radeon Pro 560X to the Radeon Pro Vega 16 will cost an extra $250, while jumping to the Vega 20 is a $350 add-on. While the Vega 16 and 20 will be handy for those on the move, it isn't the only graphical upgrade on offer. Apple also launched the Blackmagic eGPU Pro equipped with a Radeon RX Pro Vega 56 GPU, making it a more powerful add-on option for those who need higher performance and are willing to work from a single location rather than being more mobile. Apple plans to ship the BlackMagic eGPU Pro in late November, priced at $1,199. For a limited time, Apple authorized reseller Adorama is taking $225 off every Mid 2018 15-inch MacBook Pro with Vega 16 or Vega 20 graphics for AI readers. This deal, which can be activated with coupon code APINSIDER using the pricing links below and in our Price Guide, delivers the lowest prices anywhere on the newly released configurations. What's more, Adorama will not collect sales tax on your order if you live outside NY and NJ. For most customers, that incentive combined with our $225 coupon will save you between $470 to $790 on these brawny new machines. To snap up the discounts, you must shop through the pricing links below or in our Price Guide and enter coupon code APINSIDER during checkout. Need help? Send us a note at [email protected]einsider.com and we will do our best to assist.